Five members of the Centre for Proteome Research ran the first of six science club sessions hosted at the Victoria Gallery & Museum. 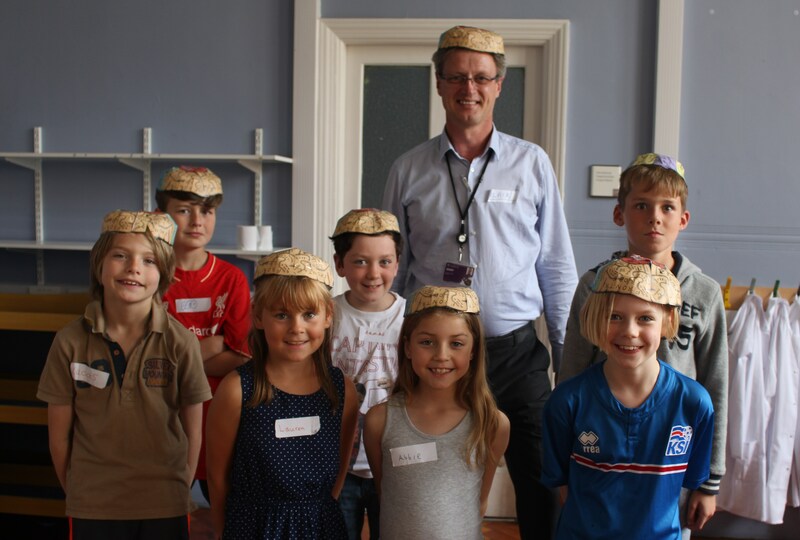 The session was entitled “Beyond the Cell” and was attended by 13 students aged between seven and 10. We started out the afternoon by introducing the students to the concept of our DNA being stored in the nucleus of our cells – to accompany this idea the students extracted DNA from strawberries and made DNA models from sweeties. We then talked about DNA being the code for proteins and how there are different types of proteins in our bodies. The students matched descriptions of proteins to the types of “sample” were that protein might be found. We also used jelly beans to demonstrate how different amounts of proteins, or the presence of a new protein, could help us to diagnose a disease. To round off the afternoon the students tried out three different analysis techniques – testing the pH of household solutions using red cabbage indicator, running dyes and inks on paper chromatography, and measuring the travel time of differently weighted marbles on a model mass spectrometer. 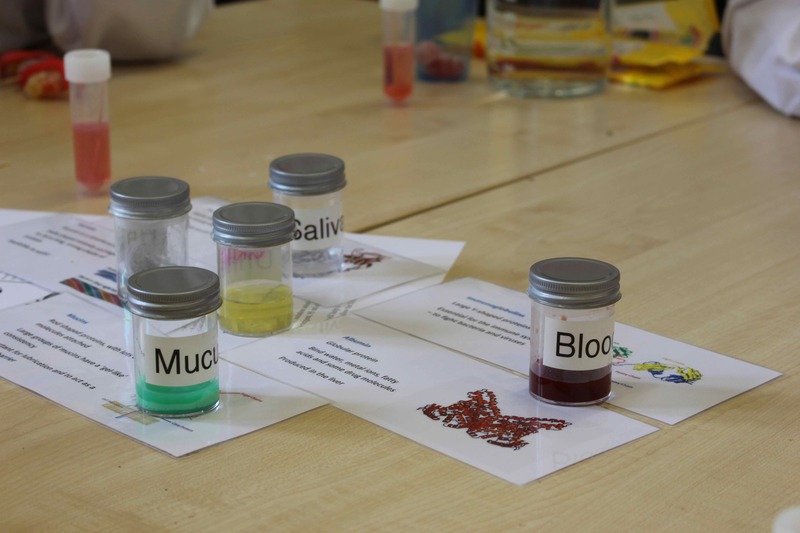 We really wanted to encourage the students to ask as many questions as possible and try to think like scientists, any they absolutely loved the hands-on activities, especially those involving sweets! The Victoria Gallery and Museum (VGM) started in 2008 as the University’s contribution to Liverpool’s European Capital of Culture celebrations. As well as paintings, sculpture and ceramics it displays objects of historic, cultural or aesthetic value from the University’s science and engineering departments. It receives around 4000 visitors per month. A few years ago, my search for insects for a school visit led me to the Heritage Curator, Leonie Sedman. I visited the VGM stores with her and saw shelves of objects once used in the University’s zoology teaching and research. From this chance meeting came a plan to bring some of them back to public display through collaboration between the VGM and B. Sc. Life Sciences degree students. Four students have worked on their final year projects using this material with Leonie, Lu Vieira de Mello and myself. The result is thought-provoking exhibits at the VGM about egg collecting, critically endangered pangolins and rhinos – and a witchitty grub embedded in resin for visitors to handle. From the first two student projects with VGM; Witchetty grubs in acrylic. The students were Lewis Wade and Harriet Passey, both graduated B Sc Biological Sciences in summer 2014. The museum materials are at the centre, but other objects like a 3D print of a rhino horn (thanks to the School of Architecture/Creative Workshop), molecular image of keratin and video of live pangolins put them into a twenty-first century context. What do the students get from this? Project results that communicate science to visitors, an insider’s introduction to museum curation and the challenge of bringing objects, research and imagination together.